Each month, readers or reader’s dogs have been chosen by the popular vote at Ask Spike Online. The highest vote-getter on the poll will be the next to join Spike’s Pack. At the end of each month, we will be collecting votes in a poll to determine a new dog to join Spike’s Pack. To submit your dog for consideration, submit a large photo and a short biography of your dog to spike@askspikeonline.com. Congratulations to the following dogs for their inclusion in Spike’s Pack. March 2009’s additions to Spike’s Pack are Snickers and Sonny Bear Miller. Snickers is a Fourche Terrier — a Westie/Yorkie mix. 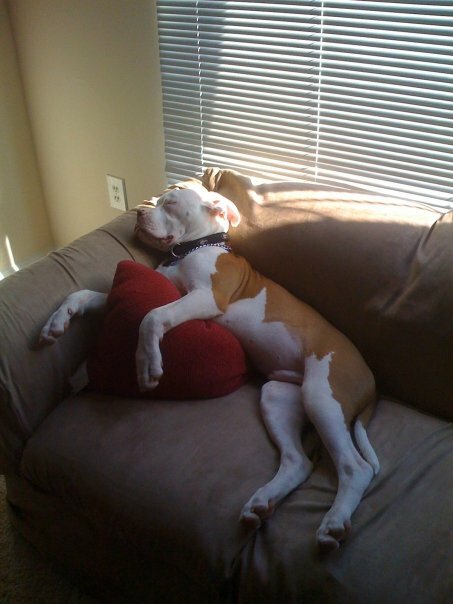 He was adopted from a rescue in Chicago, IL. when he was a year old. Snickers was very fearful and slow to trust when he was first adopted, but with time, patience, discipline and love, Snickers came around. Now, he loves to run around Grant Park, chase his friends in the dog park and get as many belly rubs as he can from his Mom. February 2009’s addition to Spike’s Pack is Jesse Scott. Jesse is a Rottweiler/German Shepherd mix, and he lives with his dad in Mesa, AZ. He has a long tail, but you can’t see it in this picture. Jesse was adopted from the pound when he was just 6 months old, he had been surrendered there and abandoned. When Jesse was found in the pound by his dad, the first thing he did was lay the side of his head in the palm of his dad’s hand and looked right into his eyes when he reached to pet Jesse. His dad instantly fell in love with him and brought him home that day. Jesse has lots of toys but his favorite is his tug rope, and he loves to go for walks and to the park. He likes to chew on and play fetch with sticks, and he loves everybody he has met and all other animals, including cats. Jesse loves to go for rides in his dad’s pickup truck, in the cab, not the bed. Jesse has his own easy chair, and it is his favorite place to nap. His dad is not sure if Jesse is a bed hog, or if he just likes sleeping snuggled up close to dad. He has three canine cousins in the family, 1 boy & 2 girls that he loves to visit & play with. Jesse weighed 25 pounds when he was brought home, and he is now 11 months old, weighs 65 pounds, and he still has a little growing to do. January 2009’s addition to Spike’s Pack is Smokey Harden. Smokey is a king. He lives in Henry County, Ga. He likes to wait until his dad comes home, because he knows they are walking to the mail box. He loves to be outside. When his mom comes home it’s time for dinner! While mom and dad are at work he takes care of the house. If he gets the opportunity to get in the bedroom, he will destroy all of the pillows, for they are the enemy. He loves to go to the beach and anywhere else he can. He is fully house-trained. Mom and Dad gave him a bell by the door, so he can ring when he needs to go potty, or if he just wants to go outside to play. Recently, I got to hang out with Smokey’s new baby brother, Biscuit, whose pictures can be seen here and here. He loves doggie treats, and on the weekend he gets bacon and scrambled eggs for breakfast. 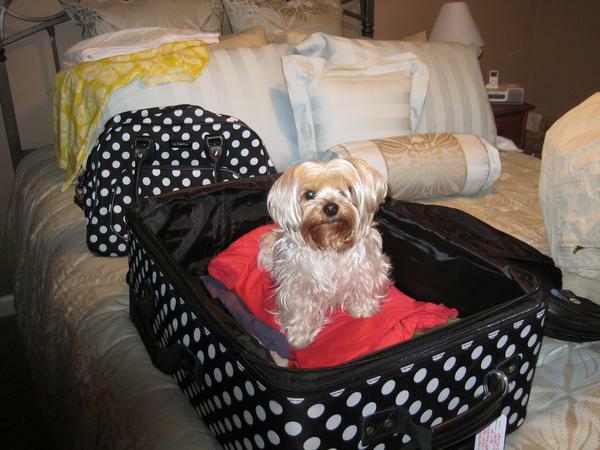 November’s addition to Spike’s Pack is a Yorkshire Terrier, Lucy Suiter. 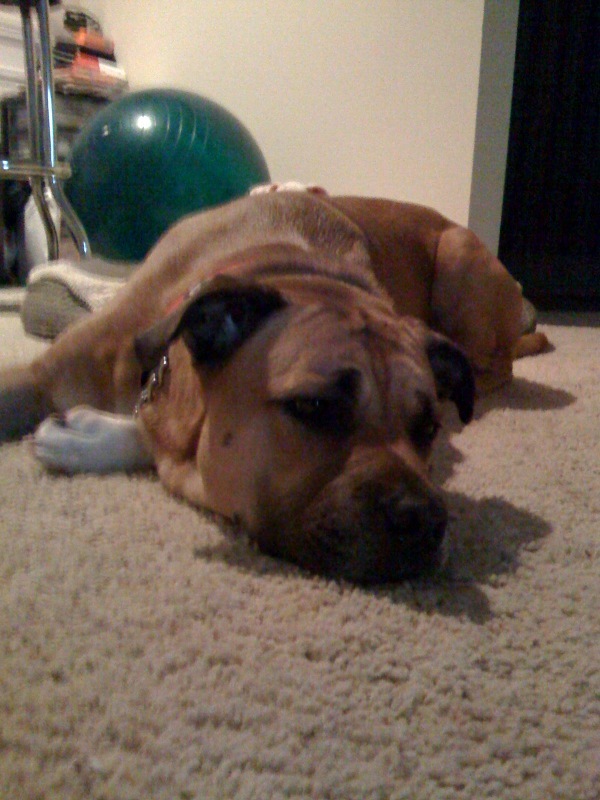 Lucy lives in Atlanta, Georgia and she is loved by Amy and Corey Suiter, her parents. Lucy is an adorable, prissy little girl, and her sweet face gets her out of trouble most of the time! She likes mischief, and she truly is the boss of the house. Nine times out of ten, you can find her pulling the toilet paper off of the roll, or hiding “little treasures” under the bed and sofa. She likes to sleep, play hide and seek, play with her “brother-in-law” Bailey the Schnoodle, visit her grandparents in Brunswick to play with her brothers Sam and Nemo (kitties), de-stuff toys, eat treats, and sneak food from the table. That just makes me wag all over! My name is Sophie. I am a German Shepherd/Retriever mix (so I am told). Someone found me abandoned and with a badly broken leg. They took me to the Humane Society in Bellevue. Unfortunately, the veterinarian could not save my leg, so he amputated it. Shortly after that, I met my Pet Partners, Bill & Cathy Griffin. SophieAfter my amputation healed enough, I took my two human companions to training classes. They were pretty smart, so we were able to get registered as Delta Society (www.deltasociety.org) Pet Partners fairly quickly in 2003. Our first visits were Saturday morning to the rehab floor of a hospital. I remember one lady had a severe stroke. But she somehow reached out to me and whispered words to me. Sometimes you can’t see the smile on the surface, but it is there underneath. Then we started visiting assisted-living/Alzheimer’s facilities. When I come into the room, everyone smiles and I just don’t know who to go visit first. One lady has severe disabilities. But when I come over to her, she always says “I am so happy, I don’t know what to do”. That just makes me wag all over. On Tuesday, we also are visiting another hospital now. There is one nurse there who gets down on the floor and gives me a special petting. I think she might have a second job as a “professional petter”. All the staff say I am one of them and I am expected to do my job. It makes me very proud. I just sit or lie by the bed and listen to the patients tell me about their pets. Only humans would name a big dog “Fluffo” and a tiny dog “Thunder”. cathy and sophieSo, I have a rather busy ‘social calendar’ as a Pet Partner…..Yep, on Tuesday evening I’m at Overlake Hospital, Wed evening at The Gardens in Bellevue, Thursday at Wynwood in Bellevue, Friday at Overlake Terrace and Saturday morning at Swedish Hospital (rehab and post op floors). Our primary time at all three assisted living facilities is with the people who have Alzheimer’s and then a shorter time with the “regular” residents. I have quite a large group of special people I like to “hang out with”. And, thankfully – Bill and Cathy are pretty good with the folks, too. Bill and SophieIn 2006 I was entered into Delta Society’s National Beyond Limits Awards and received an Honorable Mention Award. But I already have the best reward in the world, going from friend to friend to friend! Oh boy! Here comes my green Delta Society Bandana. We get to go visiting again. Thanks Spike, Jesse is thrilled to be part of your pack. We are thrilled to have added Jesse.